Organizations and companies with Inventory and warehouse, must follow and manage the inventory movements and entries, inside the warehouses and out. 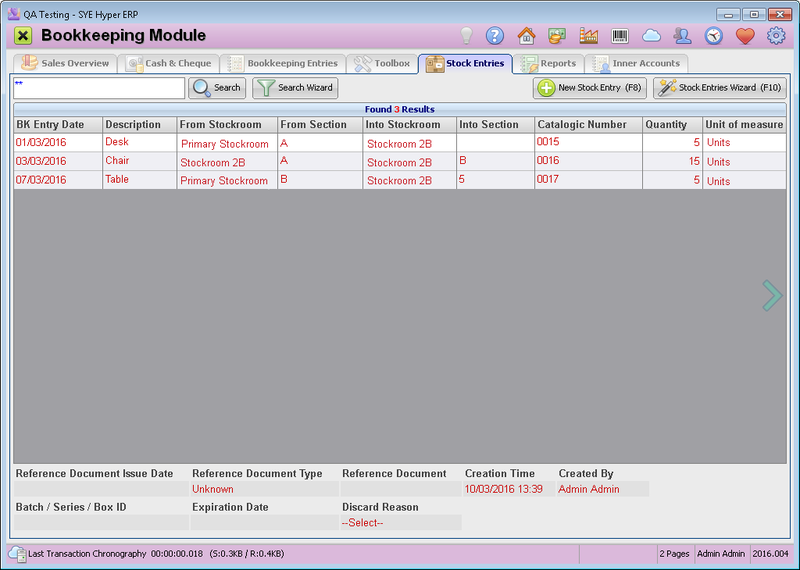 This tab of the Bookkeeping Module allows to manage the inventory of the organization in warehouses or shops that where defined in Hyper. This tool assists the purchasing and the stockrooms managers to follow the inventory and the quantities, and alerts if additional purchasing or production is required. This tool also eases the the inventory count process. The table displays the stock entries, according to the search field value or the required filters of the Search Wizard. Each row displays a stock entry as well as information fields about this entry. Additional information fields can be added to this table according to the users requirements and can also be displayed at the bottom of the table. Search Search for the required stock entries according to the Description / Catalogic number / Client / Supplier Name. The system displays the results from the last 30 days. Earlier stock entries are saved in the archive and therefore can be viewed by using the required filters in the search wizard. Search Wizard Use defined or customized filters to search for required stock entries. New Stock Entry (F8) This button will open the Stock Entry window, to report a new stock entry or modify entries. Stock Entries Wizard (F10). This button opens the Stock Entries Wizard Stock Entries Wizard window, that allows to create a new stock entry and produce a formal document for it. In order to use the Stock Entries Wizard, the stockrooms must be defined in the Stockrooms tab of the system fundamentals.